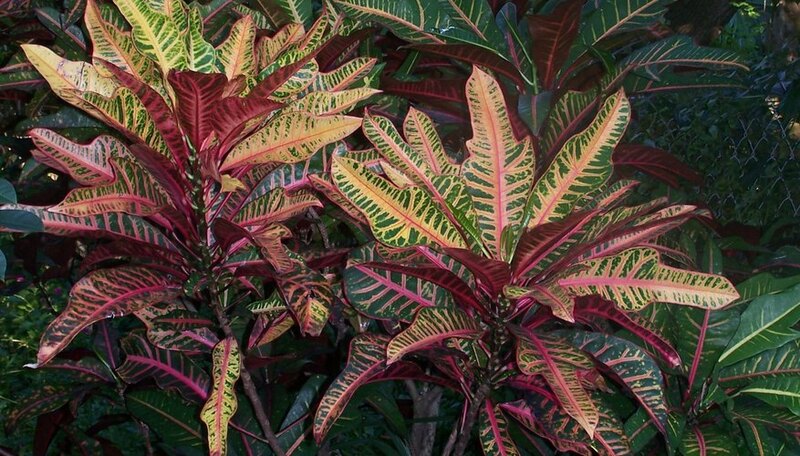 Crotons are tropical plants that grow well outside in the warmer regions of our country. To keep a croton's size controlled and to shape it up, pruning is necessary. Since some species can reach a height of 10 feet, its best to trim them back. Crotons will also benefit from pruning because it will allow the plants to branch out and thicken up. This will make the entire plant look better by not having long straggly limbs that would occur if the plant is left unpruned. Crotons are one of the easiest plants you can prune. Wait until all signs of frost or freeze have left your area before trimming the croton. Crotons are very cold sensitive, and by pruning them too soon you can open the plant up to more serious damage if a cold snap hits. Prune the entire croton plant back by one-third in the spring or summer. It is not advised to cut the plant back by more than one-third, as this can stress the plant too much and stunt its regrowth. Cut the branch right above a leaf eye with freshly sharpened pruning shears. New growth will sprout out at the eye section. Wait until new growth has established itself on the croton before pruning again. Prune the croton branches that you desire to branch out and be fuller, if you are not pruning the entire plant at one time. By pruning several branches at a time, the croton will not look so bare while it is developing new growth. There is no need to treat the wound on the branch where you pruned it with any type of branch sealer. Trim off all the leaves on the pruned branch, other than a few on top, and dip the end in rooting hormone. Place the branch in a light, well draining potting medium and keep the soil moist. Your cutting should start to develop roots in a few weeks. Replant in the garden once the croton has established itself in the container. Do not prune your croton in winter as it can be seriously damaged by the cold weather. Crotons tend to be top heavy, so pruning them will keep their shape more uniform.